Learn How to Become a CFP® and the Benefits of the Designation. 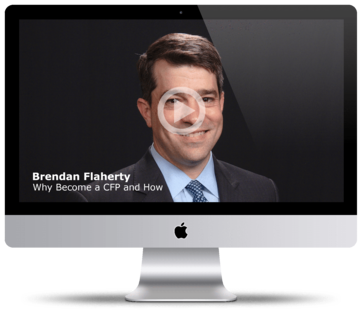 Listen to Bryant University's Program Director's Personal Experiences before and after becoming a Practicing CFP®. "The CFP® designation has helped me grow my business considerably. Since becoming a CFP®, I've retained important clients and the process of attracting new clients is much more straightforward. Existing clients, potential clients, my coworkers and my colleagues all see me in a different light." Learn why you should get the CFP® now. Learn the competitive advantages the Designation offers. See what sets CFP® certificants apart from the field. Learn the benefits of studying with Bryant University. Learn the CFP® requirements. See below for quick guide. Research Educational Programs that meet CFP® Board's Education Requirement. Bryant has several Program options. Each is tailored specifically to meet the needs of a different learning style. Call a Program Specialist today at 888-596-1504 to find out which one fits you best. All Bryant students have 24/7 access to their CFP® curriculum for 21 months from the day they enroll. 21 Months is more than enough time to complete the entire Program. In fact, our Accelerated Virtual Classroom Program will put you on pace to complete the Full Program in only 10 months. Prepare for the CFP® Certification Exam with a Review Program. Much like Core Curriculum Programs, there are several competing Review Programs. We have partnered with Brett Danko, who has helped thousands of students successfully pass the CFP® Exam over the past 2 decades. The Basic Exam Prep package is retailed at $895 and can be bundled with Bryant's Full Programs at the a much discounted rate. An intense and more comprehensive Signature Review is also available. If you are interested in adding an Exam Prep course to a Full Program, please call 888-596-1504 for special pricing. Pass the CFP® Certification Exam. If you diligently work through steps 1,2 and 3 you will be exceptionally well prepared for the Exam. Have faith in your preparation! We'll see you on the other side as you join the thousands of students that have passed the exam using Bryant's Curriculum. Meet the Experience and Ethics Requirements. The Experience Requirement indicates to the public your ability to provide financial planning unsupervised. The Ethics Requirement ensures that CFP® professionals agree to adhere to the high standards of ethics and practice outlined in CFP Board's Standards of Professional Conduct. Grow your Business and Fast Track your Success. This one is self explanatory. Once you become a practicing CFP® professional, you will begin to reap significant benefits, including prestige, acknowledgemnt and higher compensation.